Our friends at the brilliant Flim Nite have put together a handy guide to the Fringe this year – something we’ve been meaning to do at First Draft for YONKS. Check it out – it features a whole host of brilliant Manchester performers who have performed at both of our nights over the last few years, and are definitely work a look while you’re at the festival. 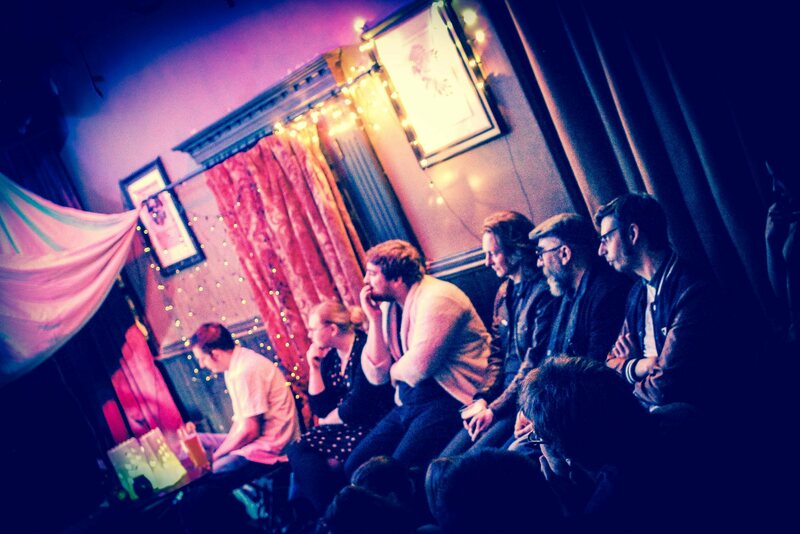 If you’ve ever performed at either First Draft or Flim Nite and you’re taking a show up to Edinburgh this August – get in touch and we’ll add you to this list. Hello! We at FLIM NITE love weakly grasping at the plastic glasses of Tennants at our ankles while beautiful art parades in front of us, and we clap, weakly, like the kings we are. As such, we dig the Edinburgh Fringe! It is 100% the best thing you can do with your August, even if you are masochistically plunging into it as a performer (like we both are— please scroll immediately to the bottom of this post, where we have humbly hidden our show plugs). A lot of FLIM performers are up this year, and you should go and see them because, as you know, we only book SOLID GOLD ROCKSTARS. Spoken word powerhouse Paula Varjack brings her acclaimed show to the Bedlam Theatre in Edinburgh where we’re really excited to be able to see it for the first time, having missed it when she brought it last to Manchester – though we wouldn’t recommend it to you without already knowing that it’s going to be an engaging and very pertinent show about the value of arts in our society. If you support the arts in any way (and you do, ‘cause you’re reading this blog post) this is a do not miss. Siân performed some rad character comedy for our Fifth Element FLIM and she’s making something really special this Edinburgh, as her show sees her quit this hectic political millennial life to become a lemon. Expect absurdity and joy! Her sketch show ‘Siân and Zoe’s Sugar Coma Fever Nightmare’ is also set to be rad. Spencer Jones makes comedy that is beautiful, surprising, and ultra-importantly, cry-laughsomely funny. DIY props, clowning and character comedy collide in Spencer’s stuff, and he’s sure to have made a show that’s tender and inventive. Plus he’s been on telly loads, so you get to see someone who’s been on telly loads! Tell your mates around the watercooler. ‘I think I saw him on Live at the Apollo,’ one will say. ‘I didn’t really get it.’ And you’ll be the winner. We’re really really really super duper 110% very much excited for Jackie Hagan’s play’s first outing which we’re sure is gonna have her trademark wit and smarts. Set in the town of Skelmersdale (Skem) where Jackie grew up and focuses on two characters who were born there. Graeae are a really exciting theatre company and we can’t wait to see the results of collaboration between all these cool people/organisations! The Powder Keg gang, including FLIM NITE pal Ross McCaffrey, are performing for their first time at Edinburgh as part of Summerhall’s Northern Stage collaboration. It’s a powerful discussion of the current political climate and how the political intersects with the personal, featuring time travel and an excellent airport scene. It also may be the only show we’ve seen to have its own theme song played live on stage with electric guitars. We saw this show in a past incarnation at the Anthony Burgess Centre for HOME’s PUSH festival earlier this year and we’ll definitely be attending to find out how the show has progressed following the recent General Election! WMD Comedy, including comedian and FLIMer Tom Dransfield, are going to make everything better for Edinburgh Fringe audiences until the last week when they’re going to leave us to our usual misery, thanks. Expect sketches much like the weekly ones they create for Youtube (check them out) but with less technology involved and more being on a stage in front of you involved! Catch them while you can for a brief ray of sunshine in our otherwise bleak existence! We were lucky enough to catch this show last year at Sheffield’s Moor Theatre Delicatessen, an evening in which we were led down a series of dimly lit corridors before ending up in a makeshift place of worship / solace / residence: the Church of Jim. But who is Jim? Forest Sounds Theatre, including FLIM performer Andy Owen Cook, show us that there is hope to be found in a post-apocalyptic landscape ravaged by humanity, even if humanity’s coping mechanisms are slightly bizarre. We’re looking forward to seeing how the show has developed and been translated into an hour-long Edinburgh outing and recommend you all join the Church as well. The internet has some dark, dark corners and we’re looking forward to pretending we don’t spend all our time there. This Manchester-based double act run an amazing night of alternative comedy in the city centre and now they’re taking their debut hour to Edinburgh. Their stuff’s always rad: one half of these nice hot sausages, Amy Gledhill, did our Face/Off event and got the audience both doing yoga and killing each other with fingerguns, which to be honest should be enough to sell you on this show. Know nothing about kink? How to spell it? How to write the letter K without it looking like a wonky H? Well, no matter, because Ros Ballinger is here to explain all (except probably not that stuff about spelling and handwriting, that’s quite specific, sorry.) Have a few drinks, but not too many, you monster, and go see her at The Newsroom before she leaves mid-Fringe! Sarah cruuuushed it at our Mulholland Drive event and is known through the circuit for high-concept hours of fun dumb stand-up, and we can’t wait for this one! If only for the fact that she’s really committed to a prop and now has to take 23 piñatas on a train to Scotland with her. Whether or not this is one of the show’s catalogued mistakes remains to be seen. And we’ve come to this, the dirtiest section of our Fringe guide, the shows we obliged to plug because we are, uh, in them. Come and see us, yeah? Let’s get a pint? Stronger. Stranger. Hunkier. Sopping-wet sketch boys Beach Hunks return to Edinburgh with a new hour of destructively offbeat comedy. Absurdity, misery and beachwear collide in a show populated with broken characters and frothing with big dumb fun. Join them. Hoot. Holler. Go hog wild. Hostperson Jack Nicholls and his team of one, David Duncan, present their second hour of sketches as Beach Hunks and they got bitten by a load of pigs for their poster image so go and see them, they’ve earned it. An sci-fi adventure in existential crisis, a blend of bulls**t arthouse theatre with nonsense games and DIY props. Expect lo-fi dream sequences, an awkward five-minute docking scene, and rapid oscillation between existential crisis and ridiculousness. Me Me Me poke fun at the avant-garde, science fiction cinema, the audience, and crucially, themselves, in a mixture of theatre, sketch comedy and audience interaction that blends together into a surreal and anarchic hour long show about space and uh, loneliness.